You can huff and puff… But you won’t blow this straw bale house down. One year ago, my friends, family, and I set down the first of 200 straw bales that would soon become the walls of my new straw bale cabin. 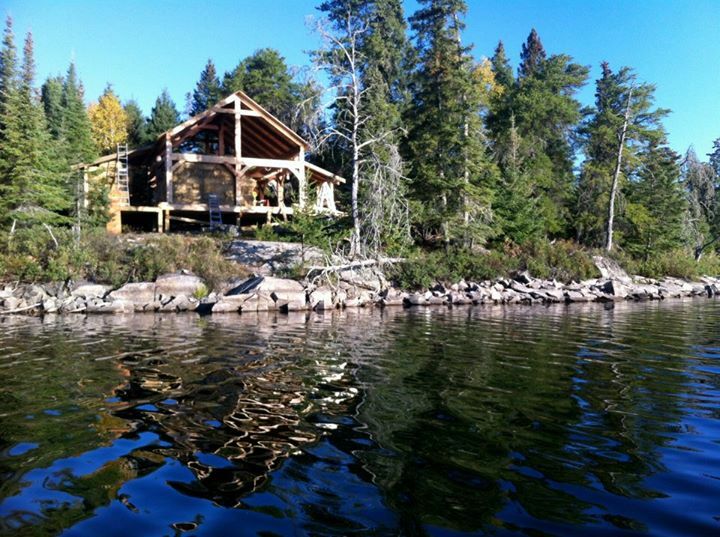 Today, the cabin (which is now known as ‘Whiskey Jack’) sits on the beautiful shore of High Lake ready to be rented as the latest addition to the Falcon Trails Resort Eco Cabin rental fleet. When my parents (journey-WOman carpenter Barb Hamilton and Craig Christie) first approached me asking if I wanted to lead this construction project, I jumped at the opportunity. Under one condition… that we would step outside the box and try our hand at building with straw bales, an unconventional but extremely smart and environmentally friendly form of construction. 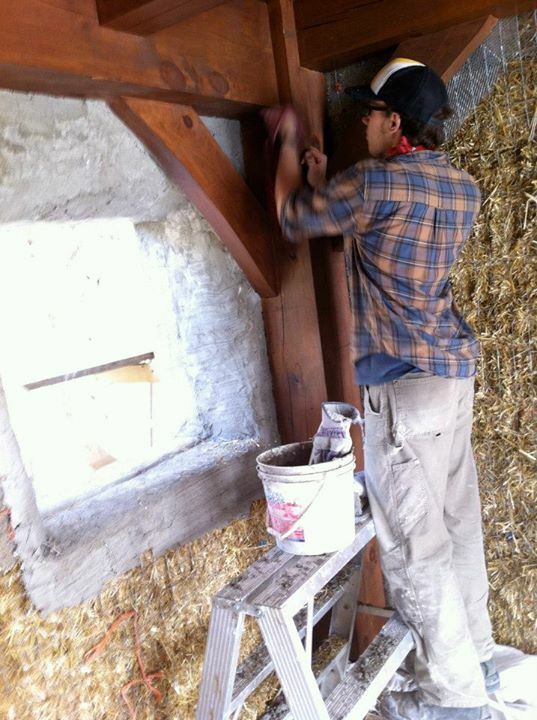 Straw bale buildings are best known for their efficient insulation. Compared to a conventional home, which typically has around an R20 insulation rating, straw bale homes can have anywhere from an R35-50 rating. Often, people will be concerned with pest and fire problems when they first learn about these buildings. 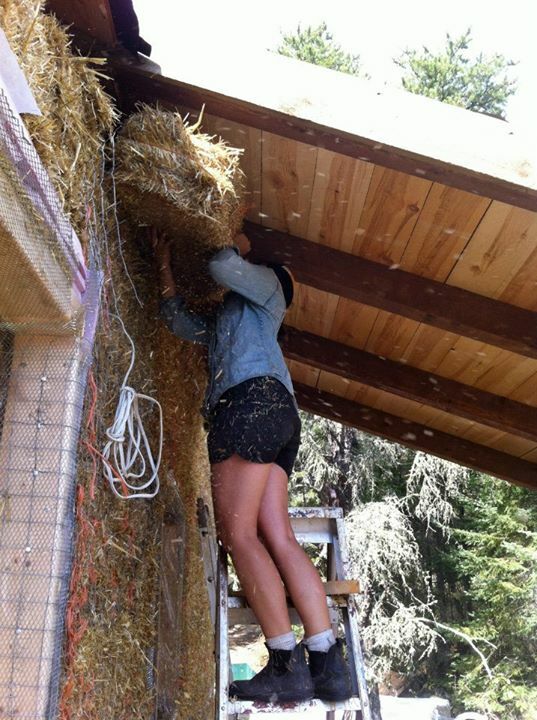 Studies conducted at the University of Manitoba have shown that straw bale buildings are less prone to these types of issues as mice tend to prefer the less dense fiberglass insulation of conventional homes and fires have a hard time catching on bales that are so tightly packed. The cement/lime stucco, which is applied to either side of the bale, both protects the bales from rain and water damage and acts as a type of desiccant, wicking up unwanted interior wall moisture and allowing it to flow to the outside of the building. Presented with these facts, my parents became excited to take on the project with me. 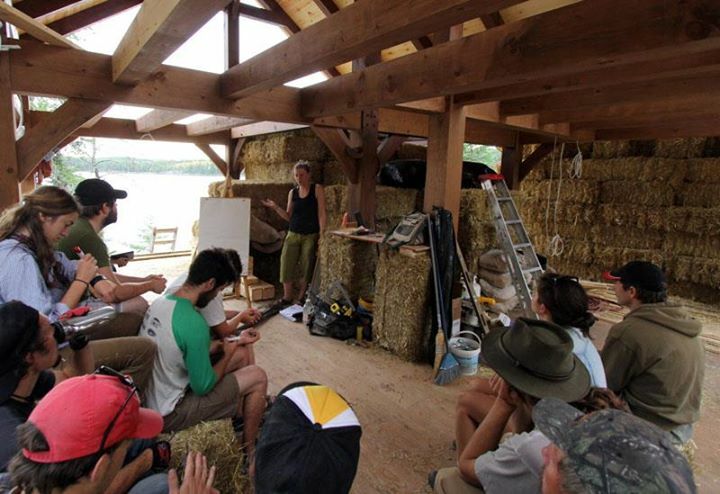 The building kicked off on the September long weekend of 2012 where we hosted a straw bale building workshop lead by Paul Reimer, my former high school english teacher. 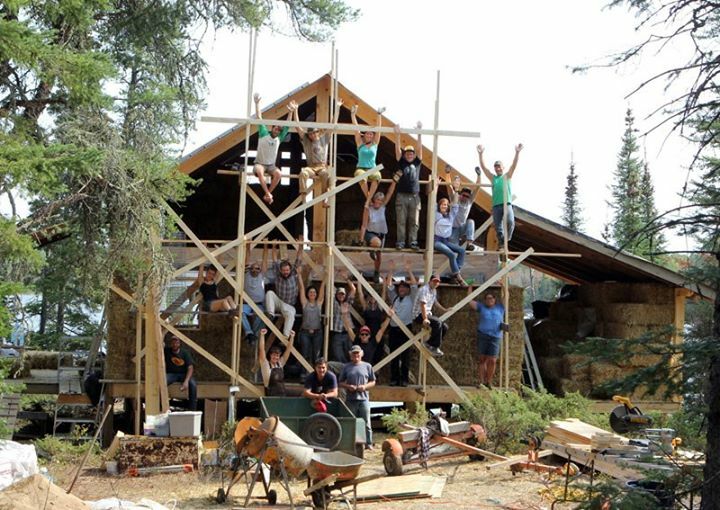 Twenty course participants, a lot of whom were friends, showed up to try their hand at straw bale building. The crew was quite eclectic; carpenters, blacksmiths, musicians, beekeepers, forest fire fighters, documentary film-makers, farmers, and even a falconer! We had a diverse skill set to say the least. 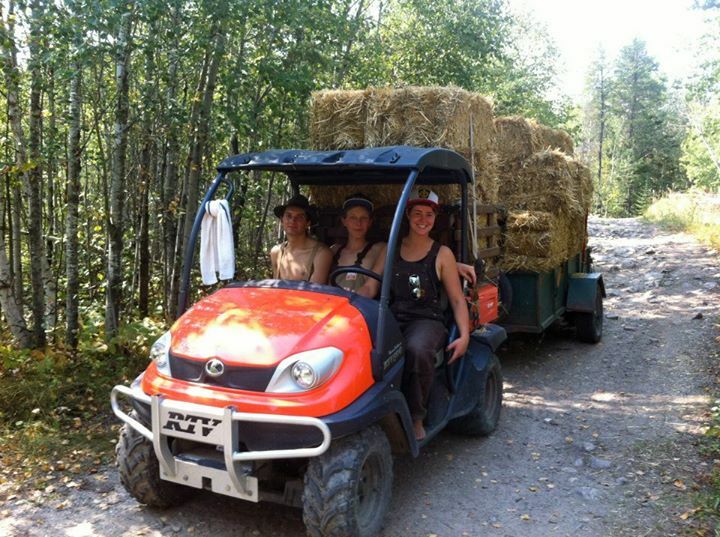 Once the course was completed the “Straw bale Crew” (Brooke Christie, Kristine Askholm, Kurtis Ulrich, Benita Cleaver, Jesse Matas and I) camped out at the High Lake boat house and continued to work on the walls through the months of September and October to finish them up. The memories of working on Whiskey Jack for those two fall months last year are some that I will never forget. It doesn’t get much better than sharing meals, music, learning, and fun in such a beautiful setting with some of your closest friends. 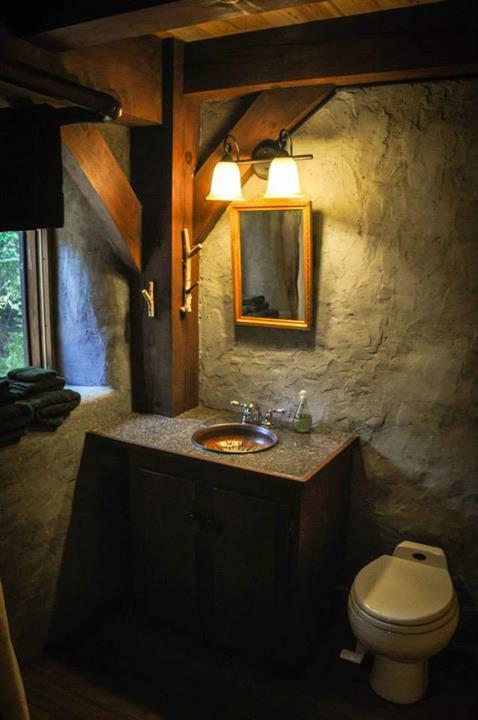 Many months later, with the immense help from my parents and countless other friends, we now have a beautiful low-impact straw bale cabin for rent. I can’t wait to show the guests of Falcon Trails Resort how this unconventional building technique can offer efficiency, beauty, and comfort within the cabin setting. This entry was tagged Eco Cabin, Falcon Lake, Falcon Trails Resort, High Lake, straw bale cabin, Whiskey Jack, whiteshell provincial park. Bookmark the permalink.